7.1 Which Path to Take? There is an increasing interest in natural and holistic medical treatments for many different diseases and conditions, particularly home remedies for acid reflux. Some home remedies may alleviate the symptoms of acid reflux and provide relief, while others can manage their acid reflux diets and avoid certain foods to minimize the causes. Consumers should be aware that home remedies for acid reflux claiming to be cures are obviously false since the primary cause of acid reflux is the malfunction of the lower oesophageal sphincter muscles and there are no known methods for correcting this malfunction naturally. However, despite no cure for acid reflux, we can offer advice and tips on home remedies, treatment, and the proper diet to offer acid reflux relief. Certain foods trigger the production of excess stomach acid. These acid reflux foods to avoid include full fat dairy products, fatty meats and fried or spicy foods, citrus fruits, tomatoes, chocolate and foods and beverages containing caffeine. Avoiding these foods will help in controlling acid reflux symptoms. We also advise you to eat small meals at regular intervals during the day to avoid overworking the digestive system with large meals and indigestion. Eating slowly and chewing food thoroughly are other remedies for avoiding symptoms. Consumers should learn more about the proper acid reflux diet before trying antacids or home remedies. Sometimes the best acid reflux treatment or remedy can simply be better diet and exercise that avoids foods that cause heartburn. Acid reflux symptoms are often more severe at night since during the day people are upright and swallow frequently which helps prevent acid from backing up into the oesophagus. Sleeping on a slight incline with the head about six inches higher than the feet can provide night-time relief. This means inclining the mattress or using a wedge, not a conventional pillow. Not eating or drinking anything for two to three hours before going to bed is an easy home remedy that can ease night-time symptoms of acid reflux. Ginger Root is another common herbal remedy for acid reflux, absorbing your stomach acid with the additional benefit of calming your nerves and relaxing you. Ginger root capsules or pills can be purchased from most health stores or pharmacies, and we suggest taking one capsule after dinner. Anise and lavender tea have also been known to offer heartburn relief. Anise and lavender tea reduce the production of stomach acid and remedy your acid reflux. To brew a delicious tea, we recommend equal parts aniseed and lavender mixed with water, letting the tea sit 5 minutes before straining it and adding a bit of honey to soothe your throat and oesophagus. Baking soda is a chemical base and will neutralize the hydrochloric acid produced in the stomach. Baking soda, an antacid, is also the main ingredient in many acid reducing medications, but will not prevent excess production of stomach acid, just simply neutralize the acid production in the stomach. Acid reflux solutions are all-natural and effective in giving aid from heartburn without any facet consequences. They are safe as in contrast to chemically formulated medication that lead to some or the other facet results. The most dreaded symptom of this issue is heartburn, which is the persistent burning symptom in the chest, which is irritating and offers a headache. There are a lot of medications formulated exclusively to handle this problem, but those medications are not risk-free and are linked with adverse side effects if taken for an extended time. Pure house cures are secure as in comparison to chemically formulated medications and can be taken even by pregnant ladies and kids. Just before we shift on to these cures, allow us realize this issue. Acid reflux is one of the most frequent, however, unpleasant problems that can happen to anyone. It is a medical situation in which the foodstuff pipe gets irritates because of to regurgitation of acid from the belly. Acid reflux is characterised by indicators such as heartburn, acid or food regurgitation, bad breath and sore throat. Chronic acid reflux can erode the lining of the belly wall and can lead to ulcers or GERD (Gastroesophageal reflux condition). Therefore, it is important to take care of these symptoms right from the starting by getting home treatments and corrective measures to take care of as nicely as avoid more occurrences. This is a quick solution that works during the acute episodes of acid reflux. Mix 1 tsp of apple cider vinegar in fifty percent glass of h2o and drink right away. This calms down the acidity and offers reduction. You can also little by little sip this water with your supper to avert acquiring heartburn. This natural herb has great absorbing qualities. It absorbs all the excessive acid in the abdomen and calms down the nerves. You can possibly just take ginger root capsules day-to-day right after supper or ginger remedy (crushed ginger in 50 percent glass of drinking water and then stress the liquid). Fennel seeds are efficient acid reflux solutions as they aid in digestive conditions. Fennel seeds include Anethole that aids in managing the cramping discomfort or spasms in the tummy. You can chew these aromatic seeds directly right after supper. Aloe Vera has a comforting impact and is utilized in managing a amount of digestive ailments this sort of as indigestion, diarrhoea and ulcerative colitis. Drink one glass of aloe Vera juice in the early morning on a vacant stomach. Liquorice root is a common natural cure utilized for ages for treating gastrointestinal illnesses. Liquorice functions by developing a protective gel coating on the tummy which aids in protecting against acid strike. It is readily available in the form of tincture or tea. Ingesting Chamomile tea soothes the infected mucosal lining of stomach and oesophagus. Rather of consuming tea in couple of gulps, slowly and gradually sip the tea to enhance its therapeutic outcomes. Pineapple contains bromelain, which assists in digestion and relieving acid reflux. This natural tea aids in lowering the volume of acid in the belly. To put together this tea, consider equivalent portions of lavender and aniseed and combine them in 2 cups of boiling water. Stress it and increase one tsp of honey to sweeten it. Consume 1 cup of this tea daily on the morning to get acid reflux aid. Almonds are an excellent source of calcium. Calcium is one of the key ingredients used in antacids used to treat GERD, heartburn, and acid reflux. Eating raw almonds before or after each meal can therefore help you contain acid reflux. In addition to this, almonds are alkaline in nature, meaning they help balance pH in the gut and the body in general. Green tea and chamomile are excellent home remedies for GERD especially for refluxes. This is because they are rich in catechins, antioxidants and phytonutrients that help contain acid reflux. The antioxidants help detox the body from harmful toxins that could be triggering the acid reflux. Aside from natural acid reflux solutions, some corrective actions have to be taken to avoid the recurrence of heartburn. Make some nutritional adjustments this sort of as staying away from processed junk foodstuff and sugar, feeding on larger parts and going to bed immediately following evening meal. Modify your meal times and consider wander following your evening meal. Drink loads of water as it assists in appropriate digestion and keeps your human body hydrated. Stomach problems, such as acid reflux, can make a person absolutely miserable. There can make your days long and your sleepless nights even longer. There have been a few days where the stomach gas will not stop and the stomach pain just moves around where it wants. There are a lot of prescription medications – tagament – available today for such conditions but many people prefer to avoid taking too many pills. Natural acid reflux remedies provide welcomed relief for many sufferers and the side effects are usually none. Acid reflux disease can cause inflammation in the oesophagus. This irritation is caused by acid and stomach contents moving from the stomach up into the oesophagus. Many people recognize this stomach symptom as acid reflux or heartburn. This uncomfortable and some time painful symptom has many of us running to drug stores looking for acid reflux remedies. One other acid reflux remedy is digestive enzymes. These enzymes will help you completely digest your food. Undigested food causes gases and toxic waste to form creating an imbalance in your stomach, which then leads to acid reflux or heartburn. Other acid reflux remedies include fresh garlic. This came as a huge surprise to all of us. You would think that garlic would disrupt the natural balance in your stomach but it does the opposite. Just adding water, garlic, and digestive enzymes diet proved to be effective acid reflux remedies. Eating protein-rich foods and other hard-to digest foods triggers acid reflux. These kinds of foods give the digestive system a hard time in digesting the taken food. This occurrence causes stomach spasms or twitching causes the abnormal opening of the muscles that separates the oesophagus from the stomach. Continued opening of these muscles continually causes the passing of the gastric acid to reach the oesophagus and throat. These can be very painful and dangerous. When you sense that you might be experiencing the symptoms of having acid reflux, you should ask the prescription of the doctor and take the necessary prescribed medications. To save money, there are still available home remedies to help you out. Before taking the home remedies, it will be more effective if you’ll undergo first a healthy diet and right practices such as an acid reflux diet. Start to lessen eating of the following foods as well as beverages: Coffee, tea, radishes, onion, garlic, spices, alcohol, oil, sugar, asparagus, soft drinks, pasta noodles, protein-rich foods, plums, corn starch, eggs, prunes, cranberries and other unhealthy foods. Following this will eventually help you in avoiding or lessening your suffering from acid reflux. There are some practices that should be done along with the proper diet. A person should avoid smoking after meals, always eat in an upright posture, don’t lie down on the bed right away after eating meals, walk for several steps to help in digestion, don’t perform exercising after meals, don’t wear tight clothes an chew the food slowly and carefully. It is also recommended by the doctors to drink lots of water. Drink as much as eight (8) glasses of water a day. Water can help the elimination of toxins and allow the neutralization of gastric acid. Green tea is also a healthy beverage although one of the family of tea (regular tea is the one that is should be avoided). Green tea is already available centuries ago in Japan as their primary beverage. Green tea can also help faster digestion and soothing the stomach’s sensitive tissues. Some herbal teas (not all) can also help in preventing acid reflux. There are very minimal traces of helping the stomach’s lining on some damages caused by excessive production of gastric acid. It is recommended to drink the selected herbal teas after dinner. These practices, healthy diets, and home remedies can also cure a lot of other painful diseases. Doing this will not only prevent you from having reflux but also can prevent you from additional sufferings caused by other diseases. Many people avoid taking prescribed description for acid reflux remedy; rather they opt for other alternatives such as homeopathic remedy for acid reflux. Similar to medical prescriptions, homeopathic remedy is also required to be taken for a certain period of time until the acid reflux problem is not cured. Once cured you should discontinue use of these medicines. A genuinely prepared acid reflux homeopathic remedy is not made or required to be taken for a long time. Homeopathic is often mistaken as a synonym to herbal cure. Acid reflux syndrome can be cured through use of many kinds of remedies, but a change in dietary plans and lifestyle is a major necessity as well. Herbs to cure acid reflux include chamomile, ginger root, meadowsweet and fennel. When undergoing an herbal therapy, herbalists consider herbs whose benefits are known. A herb that is used for acid reflux remedy may be a typical food herb, which though poses no danger but the effectiveness of the herb may not be known. However in Homeopathic acid reflux remedy anything that proves aiding for one may not prove to be the case for the other. If you are diagnosed of having acid reflux, you ought to regularly visit your doctor for checkups even if you feel the symptoms of acid reflux are over. You should also inform your doctor of any herbal or homeopathic medications that you have had recently or in the past. Stomach acid can badly harm the Oesophagus and more dangerous health conditions may become a threat for you. Oesophagus cancer is the most severe form of after effects. If you use herbal remedy and you feel your symptoms of acid reflux heartburn decreasing, but at the same time you are developing other symptoms such as morning hoarseness, coughing as well as wanting to clear your throat more often, then you may have what is called silent acid reflux. This form refers to the form where acid reflux irritates the voice box and no heartburn symptoms are experienced. So it is advised to regularly visit your doctor and inform him of any new or different symptoms experienced. For acquiring a homeopathic remedy, you should define all your symptoms to a homeopathic doctor. Today, some sites on the net also ask for your symptoms and advise homeopathic remedies for its cure. Unlike an herbal remedy where cure of acid reflux is found through herbs that are historically used for dealing and curing heartburn and indigestion, homeopathic medicine is founded on the idea of curing same with same. Homeopathic remedies are chosen that if taken in large quantities will bring on the same symptoms as you are experiencing now. For example if you enter some common symptoms in a website for homeopathic remedy it will give the answer as sulphur. Sulphur is a natural occurring element and not any herb. A variety of opinions exists as to whether homeopathic remedy actually does exist for acid reflux. Homeopathic medication itself in general faces varying opinions. Even in a herbal cure treatment plan change in lifestyle and diet is essential, without following which long term results are not possible. But if you do suffer from acid reflux be sure to consult your doctor and follow advice. 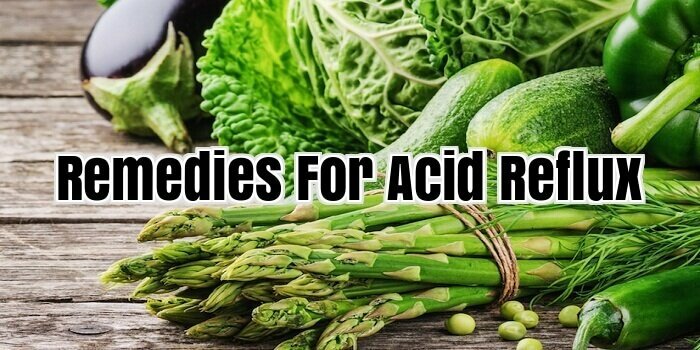 If you have acid reflex, it’s probably that you turn to antacid tablets or prescription medications, which can have facet results that rival the acid reflux condition in unpleasantness! You will be happy to know there are many all-natural, safe and successful acid reflux remedies which do not create unwanted aspect consequences. Your medical professional has probably advised adjustments in your diet regime. It really is a very good concept to preserve a log recording what you eat along with any indicators which could build following your meal. This assists you pinpoint foods and drinks which bring on assaults. Avoid fried, fatty and spicy food items, massive foods, alcohol and caffeine, which are nearly particular to bring on acid reflux signs. Chew your foodstuff properly and go for numerous small meals. Contain lots of green leafy veggies and fruits. Specific foods will serve you well as acid reflux solutions. Bananas, apples, any kind of melon, sunflower seeds, almonds and walnuts are all really nutritious and make for very good little foods. Each and every acid reflux remedy regimen must include at minimum one refreshing salad of combined greens day-to-day. There are numerous herbs which are worthwhile acid reflux cures. Slippery elm was effectively acknowledged in Native American societies as a treatment for just about any digestive dysfunction. Slippery Elm is calming to all of the mucous membranes, easing tummy upset and heartburn and has a healing effect on the tissues of the oesophagus. Other productive organic acid reflux treatments incorporate gentian root, fennel, ginger root, chamomile, catnip, angelica root and meadowsweet. Herbalists usually recommend merging a number of this sort of herbs to tone the digestive program. Seek the advice of with an herbalist to locate a combination suited to your specific situation. Another of the nicely recognized natural acid reflux cures is a tea created of a single part every of anise, lavender and peppermint. Each of these herbs is sturdy digestive tonics. Lavender aids minimize acid in your tummy, whilst peppermint is specifically beneficial for heartburn and fuel. With age, protein gets to be a lot more difficult for our stomachs to digest and undigested protein plays a huge position in acid reflux. Papaya contains papain, which is a digestive enzyme is an effective aid in the digestion of protein. Papain is obtainable in tablets at the health meals keep. Taken with every food, papain assures digestion of proteins and is productive in acid reflux solution programs. There are countless sufferers of acid reflux disease. About 85 million people in the USA alone have Gasteoesophageal reflux disease GERD and some are taking a heartburn home remedy or looking for a natural cure rather than conventional medicine. In the western world about 1 in 5 (20%) of the population suffer from heartburn once a week or more. Of these up to half will also have damage to the esophagus caused by acid reflux disease With the incidence of GERD increasing in people over 40 and people living longer, it means that the amount of people looking for relief is also on the increase. There are two paths you can take in your treatment, either the allopathic medical way or the holistic way. The allopathic way is where you take conventional drugs usually H2 Receptor Antagonists like Zantac (Ranitidine) and Tagamet (Cinitidine) or Proton Pump Inhibitors like Nexium and Omeprazole etc. This type of medication is usually prescribed by your doctor and is great for treating GERD symptoms but is not an actual cure for acid reflux disease. If you stop taking the prescribed medication in all probability your symptoms will return within a short while. However, there may be alternatives where by natural cures could be the answer in trying to break the dependency on this type of drug. Although these drugs are excellent over a short period of time, lifestyle changes can make you independent of GERD medication. So, the second path and alternative way is the holistic route. By definition a holistic solution means consider the whole body and not just the individual parts. In this case we need to look at the acid reflux and try to solve the cause and not just combat the symptoms. Alternative medicine can be used to solve the problem of over production of stomach acid as well as the prevention other symptoms. IE the medicine prescribed by your doctor will treat the symptom of heartburn without actually curing the cause, which means you must keep taking the medicine for life. Holistic medicine should treat the cause, therefore removing the symptoms. Herbal remedies for stomach complaints have been used for centuries and do not carry the same side effects you can get from the medication prescribed by your doctor. Some of the safest home remedies to reduce acid and stomach inflammation include ginger, fennel, mint herbs, liquorices, natural honey, and Aloe Vera. Other herbs include slippery elm, bladder wrack, marshmallow, chamomile and meadowsweet. If you choose to take the holistic path to cure GERD you must make lifestyle changes and recognize that the whole body must be treated in order to reduce the symptoms of imbalance in the system. As recognized by research experts some of the changes you make should include regular exercise, in some cases weight loss, dietary changes, stress relief and taking alternative medicine. One more change with great results is positional therapy using wedge pillows or bed wedges at night. While many of the acid reflux symptoms are linked to our modern way of life and eating habits acid heartburn reflux has been around since the dawn of time. The heartburn home remedy has a long history of excellent results without adverse side effects and without further damaging the system. Choosing the holistic route you must change to an acid reflux diet to that the type of food you eat does not irritate the esophagus. Repairing damage to the esophagus is the first step to curing GERD. By changing your diet to a one more suited takes planning and a certain amount of discipline. Eating large quantities of food puts pressure on the lower esophageal sphincter (LES). This is the valve type ring of muscle that stops your stomach contents from refluxing into your esophagus. Eating smaller amounts of food eases the pressure on the LES and goes some way to easing your heartburn as well as reducing the amount of stomach acid produced. One home natural remedy which has been around for a long time is apple cider vinegar. There is much documented evidence as to the benefits of an apple cider vinegar diet and many people sweat by it. You can either take your apple cider of two tablespoonfuls diluted in water three times a day from the bottle, or you can buy it in capsule form. However, I must stress that a visit to your doctor for a diagnosis is essential before you decide which path to take. You should recognize that the digestive system is responsible for the complex process of breaking down food; this means that your diet and nutrient intake are critically important to its proper function and for the prevention of acid reflux disease as well as other digestive complaints. Natural treatments such as taking digestive enzyme supplements will aid the digestion of food. A class of herbs called demulcents includes slippery elm, bladder wrack, and marshmallow is used as a remedy that aids digestion by reducing the inflammation and soothes affected areas. You can buy natural home remedies in many different forms and combinations for the soothing and healing of stomach complaints all using natural ingredients. Today, there is no need to leave the house as companies online can give you help and advice as well as supplying your heartburn home remedy needs. Creating a home remedy for acid reflux is a great idea if you have the right tools and the right ingredients to create something that will work. If you are not fully prepared for the creation of such a home remedy for acid reflux, it is probably best that you head over to a health food store and get something from there that will help you. Instead, you could be spending hours making something that may not work and may end up actually causing you more problems than you originally had with acid reflux. The choice is yours, but you should consider the possibilities of all options and their possible outcomes. Finding a dietary solution for acid reflux is one of the best ways you can combat this. If you decide to create a home remedy for acid reflux, be sure that you use the finest ingredients and that you are aware of the possible side effects of making such a thing. This includes consulting with a variety of sources in terms of how to make it and how to use it properly to get what you need from it. There is no point in creating something that doesn’t work and that eats up all of your supplies. There is no reason to waste time, especially, if you are suffering with acid reflux, on a home remedy for acid reflux when a store-bought one will do just as well. An acid reflux pillow can change the way you experience this disease in so many. Some people, regardless of how it makes sense, will decide to create a home remedy for acid reflux. This involves, then, creating a concoction of ingredients that you should have on hand. The key reason not to make one would be that it takes time whereas popping a pill or taking some medication is usually related to instant relief. A good point, however, of making your own creation is that you could end up actually curing the acid reflux instead of merely curbing the effects it has on your body. If you decide to do this, you need to make sure that you follow all of the instructions. In terms of instructions, there are generally full sets of them available from a variety of sources. A good health food store can probably introduce you to some of that information, including a good way to make a home remedy for acid reflux and examples of other remedies that worked. You can work from this template and create something that offers you serious relief and right in time, too. Going to the doctor is the right practice. This way, the doctor will examine the real problem in you and will help you to feel better. However, common drugs that are prescribe for this illness only gives you temporary relief like antacid and like all medicines, it also has its side effects. Hence, taking medicine is not a good idea. The best way to treat acid reflux is through home remedy. Natural treatment is better to make you better in the long term. A home remedy means the changing your diet rather than taking antacid, H2 Blockers and PPI drugs. There are two things that can help you with your problem; they are the probiotics and digestive enzymes. Probiotics are live microorganisms but good and friendly bacteria. It maintains the natural balance of your digestive tract. These can be found from your regular foods like soy beverages, juices, tempeh, miso, unfermented and fermented milk and yogurt. Probiotics are the same bacteria that can be found from the person guts. Digestive enzymes can normally be found in the digestive juices of the body. This is responsible in breaking down the food into smaller particles. The function of each enzyme depends on what nutrients it is acting upon. There is protease that helps digest proteins; amylase that helps digest carbohydrates; lipase that helps digest fat; cellulose that helps breakdown soluble fibre; maltase that helps convert complex sugar into glucose; sucrose that helps digest sucrose; lactase that helps digest lactose from daily products; phytase that helps digest phytic acid and alpha galatosidase that helps hydrolyzes sugars in fermented beans which causes gas.